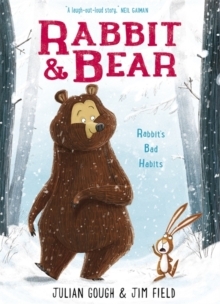 ‘Rabbit’s Bad Habits is a breath of fresh air in children’s fiction, a laugh-out-loud story of rabbit and wolf and bear, of avalanches and snowmen. The sort of story that makes you want to send your children to bed early, so you can read it to them.’ Neil Gaiman From novelist and playwright Julian Gough, and the winner of the Roald Dahl Funny Prize, Jim Field, comes a brilliantly funny story of a rabbit and bear who discover that things are always better when they’re shared with a friend …Bear wakes up early from hibernation. If she can’t sleep, then at least she can make a snowman. Rabbit has never made a snowman, but he definitely wants to make one that’s better than Bear’s. But with an avalanche and a hungry wolf heading his way, Rabbit soon realises that it might be nice to have a friend on your side. A tale of friendship, gravity, and just a little bit of poo.